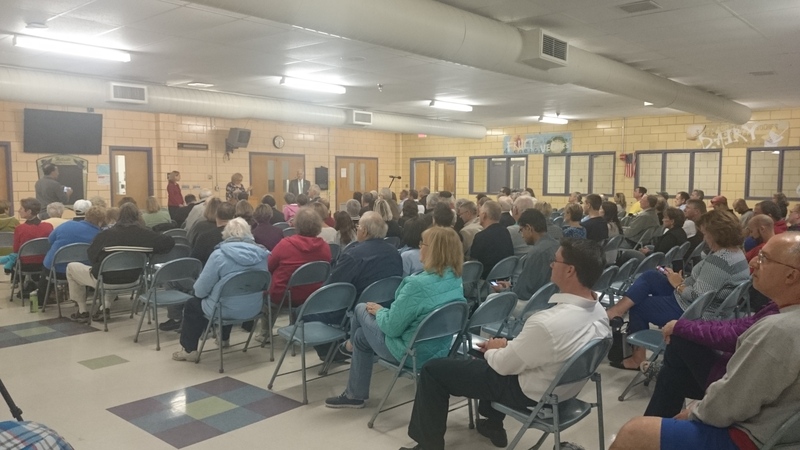 Recently there was a mayoral town hall meeting at Hillside Middle School. Both Alderman Joyce Craig and Mayor Ted Gatsas were present. The differences between the candidates were obvious from the start, with Gatsas walking around to the people already seated, talking with them, and introducing himself. On the other hand, Alderman Craig was seated at her table introducing herself to people as they walked through the door. Each candidate got two minutes and thirty seconds to answer each question asked. All questions would have to be able to be answered by both candidates. In the opening statements, Gatsas highlighted the $305m city budget. He emphasized that he would cut spending and taxes while driving education forward. He welcomed tough questions and told people to not leave until their question is answered. He also said that the city is moving to the right place, that we need someone with a vision to lead, and we need to increase student opportunity. In her opening statements, Craig said she was running because of her love of Manchester. She said that the city is not living up to its full potential. She mentioned her history of being a school committeeman and her being a current alderman, and how she went through Manchester schools and graduated from UNH with a business administration degree. When asked about the support of the tax cap, Gatsas said that the tax cap protects the taxpayers and that it leaves more money in the wallets of the citizens instead of the city budget, and that is why he supports it. It keeps spending in line and that he has always submitted budgets within the cap and that he sent every penny possible to schools. Craig said that she would submit budgets within the tax cap and strengthen relationships with the state DoE and that we are missing out on grant opportunities. It is worth noting that she got called out for proposing a budget over the tax cap. When asked about future contracts, Craig said that it is all about give and take, that we have to have good relationships. She said that her record shows fairness and collaboration. She criticized the mayor for miscommunication over the teachers contract, and that the contract was bipartisan. She said that the city was saving money by switching to an hours calendar from the contract. She said it was not the mayor’s job to decide what will and will not break the tax cap. Mayor Gatsas thanked the teachers of the city. He went on to say how he consolidated parks department into the highways department. He criticized Craig for voting against a technology bond for schools with added phones, computers, and iPads. When asked about whether or not Manchester is on the right track, Gatsas cited the 82 different languages spoken at Central. He said that we have a very diverse school district. He said we can improve the city by having a drug court, but it failed because of six Craig supporters from Manchester not voting. Craig said that we are not on the right track, and asked if the schools are better than they were six years ago, if we are a safer city, if we are a cleaner one. She said that we all agree on a drug court. She also said that there is a need for a proactive and innovative mayor that has been missing for the last six years.